What’s in your toothpaste and what is it doing for you? Brushing your teeth, if done as frequently as recommended, becomes just another part of your daily routine. Because of this, you may not have given a lot of serious thought to the toothpaste that you use everyday, whether it be a brand you stick to loyally or whatever suits you at the moment. But understanding what’s in your toothpaste may actually do a lot to change the way you think about brushing. Fluoride – Many toothpastes include fluoride, a component that helps strengthen teeth but doesn’t actually make them any cleaner. Sodium Lauryl Sulfate – You know how the toothpaste starts to foam when you begin brushing? This is the foaming agent that causes it. The purpose of the foam is to cover more surfaces of the mouth and make rinsing away debris easier. But it does very little to actually clean teeth. Abrasives – Insoluble particles also called abrasives are included in toothpaste to remove plaque from teeth which in turn minimizes cavities and periodontal disease. Abrasives can also polish teeth. Peroxide – Whitening toothpastes include peroxide as a whitening agent, but the effects are minimal. Peroxide can’t reverse discoloration caused by surface stains or decay. Potassium Nitrate – Toothpastes for sensitive teeth usually employ the use of potassium nitrate which deals with the associated pain of sensitivity, not the actual sensitivity itself. Triclosan – Triclosan is an antibacterial agent that helps reduce tartar and control bad breath. Flavorants – The most common toothpaste flavors are peppermint, spearmint and wintergreen. Flavoring provides no health benefit but helps your mouth feel clean and fresh. Less is more. Toothpaste ads may lead you to believe that you need to cover your brush with toothpaste, but really just a small dab is necessary because, as you now know, the brushing is more important than the toothpaste. Take your time. Brushing for a total of two minutes really is necessary. 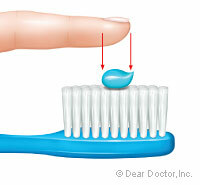 Quickly coating your teeth in toothpaste rather than brushing them thoroughly won’t do you any good. Don’t lose track of where you’ve brushed – Make sure you cover every surface. Brushing the same four spots really well does nothing for the other areas in your mouth, even if they’ve been reached by the toothpaste. In the end, when it comes to toothpaste you can use whatever you prefer. Just make sure you’re paying attention to the way you brush.